Prolong the life of your vehicle with American Transmissions. We offer transmission maintenance, transmission repair, and transmission rebuild services. Our mechanics have decades of experience working with manual and automatic transmissions and know you to put your vehicle back at its peak operating conditions. We also service manual transmissions and clutches. Free diagnostics are available for your convenience, Call us today to schedule your service needs. We also do light engine repairs & brakes! American Transmissions is set apart from the competition by our superior quality transmission repair and rebuild at reasonable prices. We also repair manual transmissions and do clutch replacement. Commitment to customer care is our number one priority. Learn more by calling our shop today! American Transmissions is a family-owned-and-operated business that has been rebuilding automatic and manual transmissions for area customers since 1977. We take pride in offering quality service at a fair price and honor most used car warranties.Visit our transmission shop today! 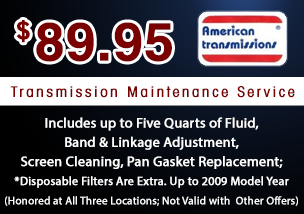 American Transmissions offers financing through Car Care One (Ask the manager for details). We also offer special discounts for seniors, military members, and fleets. Free diagnostics are available for your convenience. We offer a 12-month or 12,000-mile standard warranty for all of our work. Extended warranties may be available, Ask the manager for details. American Transmissions honors most extended car warranties. and get your FREE diagnostic scan. -Monday through Friday 8:00 A.M to 5:30 P.M.